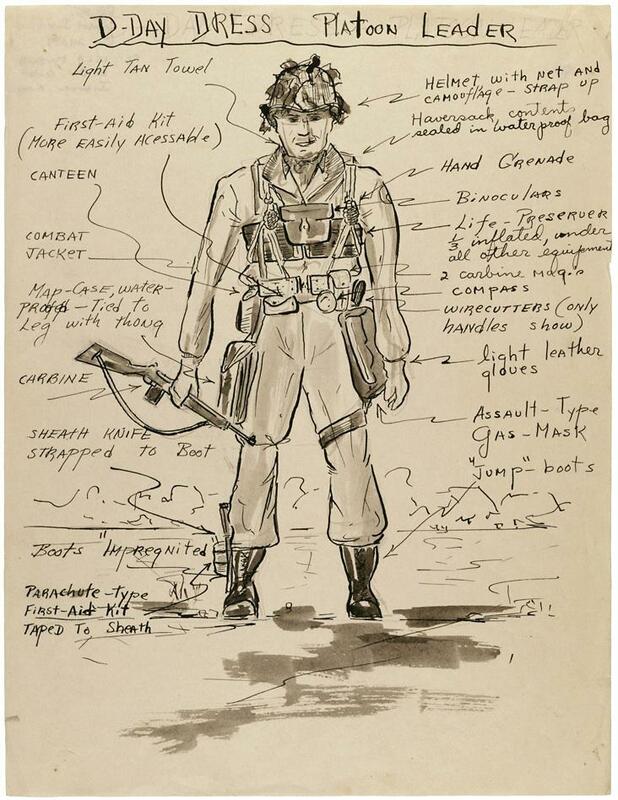 This sketch, of an Army platoon leader of the 29th Infantry Division fully dressed for D-Day, is by Lt. Jack Shea. In his annotations, Shea shows how the soldier carried not just combat gear (hand grenade, carbine, knife) but also materials meant to aide in traversing the French countryside after passing through the battle on the beach (maps, compass, wirecutters, binoculars). The soldier strapped a first-aid kit to his belt, for easy accessibility, and carried another on his boot. According to the 29th Division’s historical website, one of its regiments was part of the first wave at Omaha Beach, with the rest soon to follow. Fighting alongside the 1st Infantry Division and nine companies of Army Rangers, the 29th assaulted the western portion of the beach. Following D-Day, the Division fought in France and then Germany, remaining in Europe through spring 1945. Shea was attached to the 29th as a combat historian. The Historical Division of the War Department, home of these “historical officers,” consisted of officers and enlisted men who were former professors, lawyers, and newspapermen. Early in the war, the Army’s historians gathered second-hand battle reports and documents, while largely remaining stateside. But in 1944, General George C. Marshall ordered the group to produce morale-boosting short pamphlets about recently concluded operations, to be read by soldiers wounded in those actions while in recovery. According to the division’s second Chief Historian, Kent Roberts Greenfield, in early 1944 one of the division’s officers, in the process of writing one of these pamphlets, conducted mass interviews of soldiers who had just fought in the Battle of Kwajalein. The good results of these interviews convinced the Division that historians should be present immediately after combat, to record impressions at their freshest. Shea’s attachment to the 29th Infantry in June 1944 seems to have been one result of this policy. After the end of the war, Greenfield writes, the Historical Division was charged with a huge task: compose the official history of the Army’s actions during the conflict. They expanded on the work the division carried out during wartime, and eventually produced a fourteen-volume series, American Forces in Action (available at the Internet Archive). Lt. Jack Shea, “D-Day Dress - Platoon Leader.” Records of the Adjutant General’s Office, 1905-1981. National Archives.